In this episode Alycia interviews Stephi Williams. As National Director for the Little Miss, Pre-Teen, Jr. 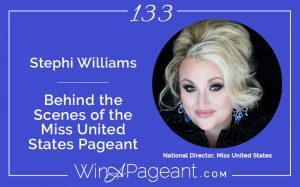 Teen, Teen, Miss, Ms., and Ms. Woman divisions, Stephi Williams shares the same vision as the owner of Mrs. United States National Pageants, Inc. As long as she can remember, Stephi has had a huge passion for pageantry as well as women who want to give back to their communities and have real purpose in their lives. As a result, she began taking classes on Nonprofit Management and Creation in her efforts to earn her Doctorate in Business. This is where she really got the feeling that she had a passion for continuing her giving and assistance in empowering others. A seasoned pageant professional, Stephi directed pageants for more than 12 years before expanding her production company, Crown Garland, to a national level as the license holder for the Miss United States Pageant. Stephi resides in Virginia with her husband and their four lovely children.